D&D Technologies SureClose ReadyFit 108 Hinge & Closer | Hoover Fence Co. 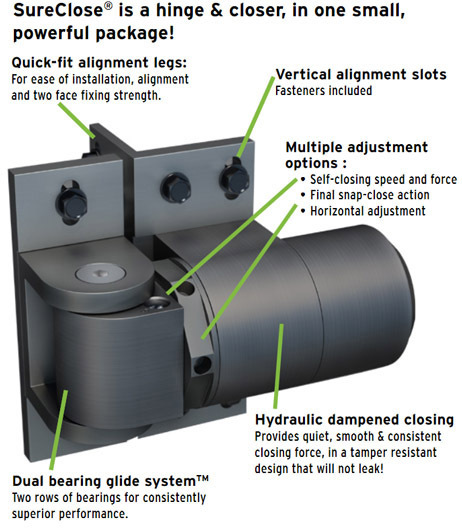 The SureClose® ReadyFit Hinges are compact, heavy-duty, hydraulic, hinge-closers designed for commercial, industrial and estate gates. Stylishly designed and corrosion resistant, SureClose ReadyFit hinges use high strength aluminum with stainless steel components, aluminum components have a 50 micron thick anodizing finish. The external mounting brackets allow quick and easy alignment and installation. No need for drilling large holes! 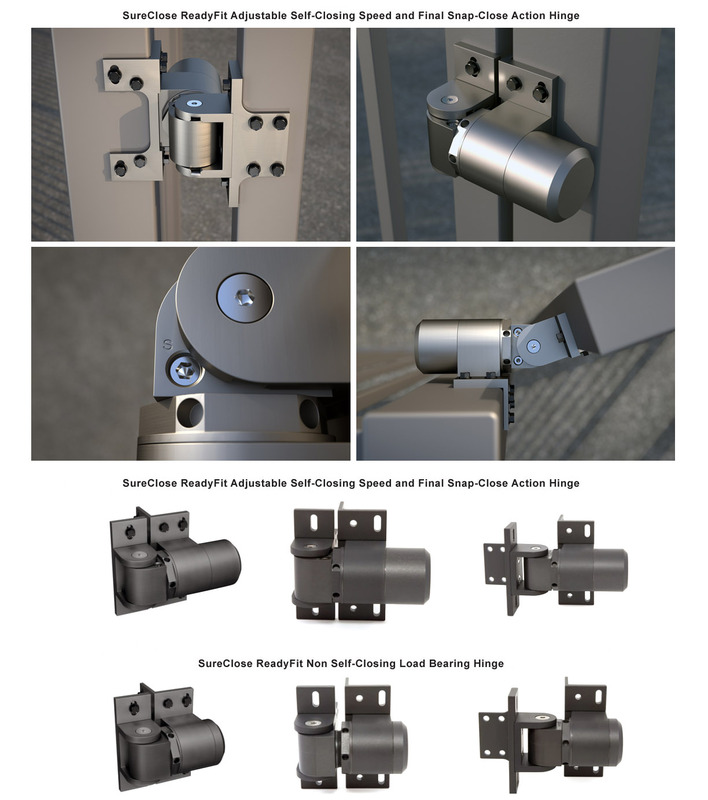 Designed for commercial, industrial, custom residential and estate gates, SureClose ReadyFit hinges come in three basic models, with choice of aluminum or steel mounting brackets. 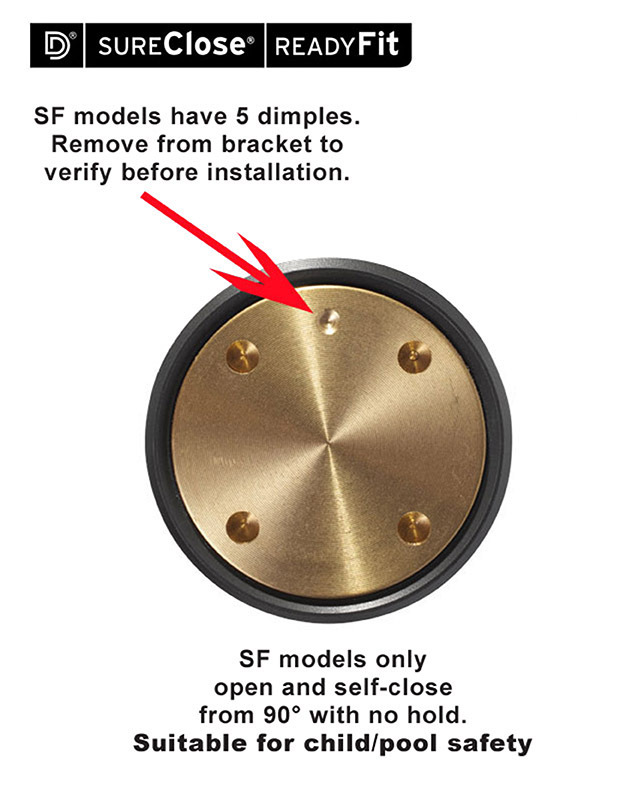 The standard self-closing model (RF 108) features a final snap action for overcoming electric or coded locks found in many security applications. Optional Safety Model (RF 108SF) does not hold open at 90°, making it ideal for Safety Gates. Also available is a non-self-closing model (RF SM) for access control and most heavy commercial or residential gates. Hinges can be used in different combinations for a variety of applications. Final Snap Action (FSA) - increases speed at the end of closing to overcome electric or coded locks. Both closing speed and FSA are adjustable. 1500 lb. (680kg.) point-load capacity. Self-closes gates up to 260 lbs (120kg). Best warranty in the industry - Rigorous testing programs ensure SureClose if of the highest quality, enabling us to back each model with a 2-year warranty. If you have any problems, D&D will handle them personally. 74001313 RF SM S n/a 178° n/a n/a 1/2" to 1-3/8" 2"+ 2.10 lbs. 74001315 RF SM W n/a 178° n/a n/a 1/2" to 1-3/8" 2"+ 2.93 lbs. 74108313 RF 108 S 83° 178° YES NO 1/2" to 1-3/8" 2"+ 2.91 lbs. 74108315 RF 108 W 83° 178° YES NO 1/2" to 1-3/8" 2"+ 3.74 lbs. 74108323 RF 108SF S 88° 88° YES YES 1/2" to 1-3/8" 2"+ 2.91 lbs. 74108325 RF 108SF W 88° 88° YES YES 1/2" to 1-3/8" 2"+ 3.74 lbs. *Caution: Based on max gate size of 72"H x 40"W (1800x1000mm). 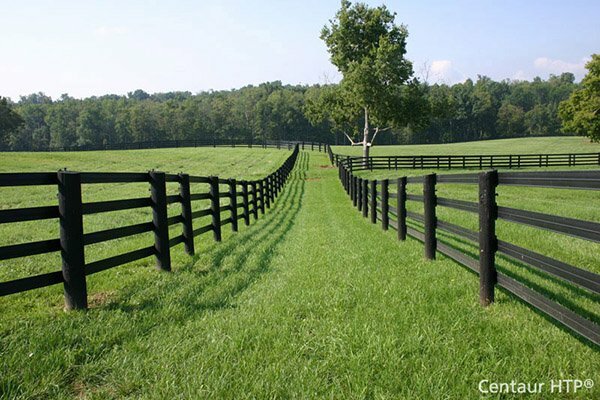 For gates with greater HxW, or if conditions such as wind play a role, use hinge combinations with higher self-closing weight ratings.